The youngest of the children I’ve taken care of as a nanny, is off to college this year. That’s a strange thought. It doesn’t seem so long ago that I was the one peeling myself from parental walls and heading out into the world. Of course, being a product of my family, this didn’t exactly go off without a hitch. It started at the first meeting with my recruiter, in town to talk about my future and scholarships and all that. I was supposed to meet her at a hotel downtown for tea and talk. About an hour before I was meant to go, my mother fell prey to crippling abdominal pain and couldn’t be peeled off the couch to drive me. I remember coming downstairs in a simple black shift, borrowed from mom, and a camel swing coat I’d picked up at a thrift store. I remember squinting at my mom, writhing in agony, and just sighing. Because of course. So I went by myself. That was the first cut. When it came to going off to school, dad was ready to send me off with a train ticket and ship my belongings. Not exactly a helicopter parent, that. Mom, on the other hand, not only came with me for moral support, but she dragged Grandma along to be her moral support as well. Or maybe just to fight with, because we tend to turn feelings into abdominal pain and angry bickering. It’s what keeps us (mostly) out of therapy. The school was in a small town, and the hotels filled up fast. The three of us were sharing a room in this terrible little place with a crooked balcony. It smelled like it had been soaked in bubblegum cough syrup – the kind of smell you can taste, it lodges in your throat and makes your mouth itch. “I don’t feel so good,” I said. I collapse in a heap on one of the double beds and curl up in the fetal position hugging an ice bucket. “Don’t lie there!” mom shouts. “Never lie on TOP of the comforter – that’s the part they never wash. I should have brought my black light.” We’re all so glad she didn’t. At least we were in a hotel, and not my new dorm. I vomit into the handy ice bucket and grams retreats back into the bathroom and the sound of gushing water. Mom calls the front desk. We are awesome in a crisis. Three generations of crazy women. Nobody gets much sleep and the next day I’m sick as ever but it’s time to head to my dorm and meet my roommate. We’re headed toward registration but there are so many bodies and it’s so hot that all I want to do is vomit into the first trashcan I see. Mom is looking pretty grim herself at this point. “Here,” she says, “Gimme your stuff, I’ll be you and get you registered for class.” She heads out all Rodney Dangerfield and I’m briefly concerned she’s going to register herself while she’s at it. Grams and I sit on the cement steps in front of my dorm and she tries to distract me by counting the ants marching across out path. She starts singing the “ant go marching” song but despite her lovely voice she can never remember the actual words to any song, so she just makes up new ones. Makes it hard to sing along with her. Mom returns from her mission, successful. We go up and find my new room with my plasticy mattress. Mom makes the bed with the flannel cowboy sheets I’d picked out. My roommate comes in and starts hanging brown paper bags from a world of Hard Rock Cafes, as though that passes for art. “Go?” I’m confused. Her flight isn’t for hours. We were meant to have dinner at the mexican place that served minors. Not the one that put frozen stir-fry veggies in their “vegetarian quesadilla”. “We can’t just leave her here all sick and alone,” Grams says, but mom is already turning pale from the stress of that moment of parting and she can’t wait for it any longer. They both hug me goodbye and leave me, half dead, stunned, and alone with a soulless blonde girl with a Hard Rock fetish. At some point, flu or no flu, I stumble downstairs for the freshman orientation in the basement dorm. And that’s when I meet my future husband. Anyway, good luck to all those freshmen drawing the blade across that ghosting umbilical cord. Good luck to the parents, too. Try not to throw up. Grams will have a good snort-laughing session remembering this. She always loved our adventures to “help” you settle into your various locations. Sorry about leaving so abruptly. Not so much sweet sorrow, that parting stuff. More like slowly peeling off a band aid. Better to just get it over with quickly – remember that in 10 years. Imagine, tens of thousands of parents doing the happy dance! Tens of thousands of dads, you mean…So the dancing is probably gin fueled and terrible. Funny about you curling up in a ball. Your “Engineer” husband whom you met, I guess at orientation, was curling into a smaller and smaller ball as his dad drove him from our state to Oregon. From what I understand, the last day, he didn’t even say a word. We stayed in a B & B and he slept on a twin bed set up in our room — and slept like a roly-poly all night. 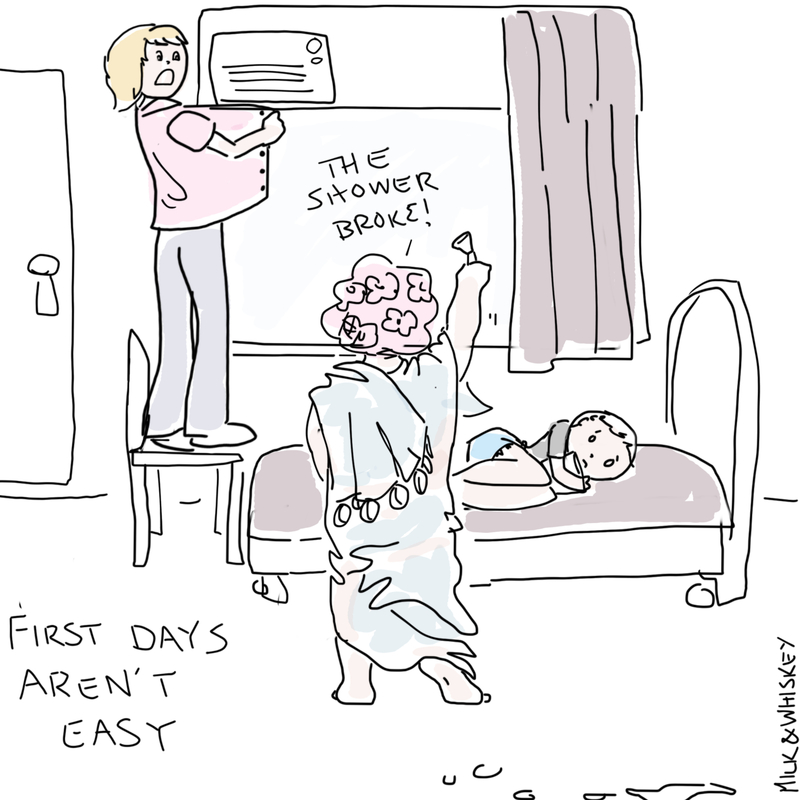 It is good to warn kids about those first few days, even though nothing anyone said would help. Only time.